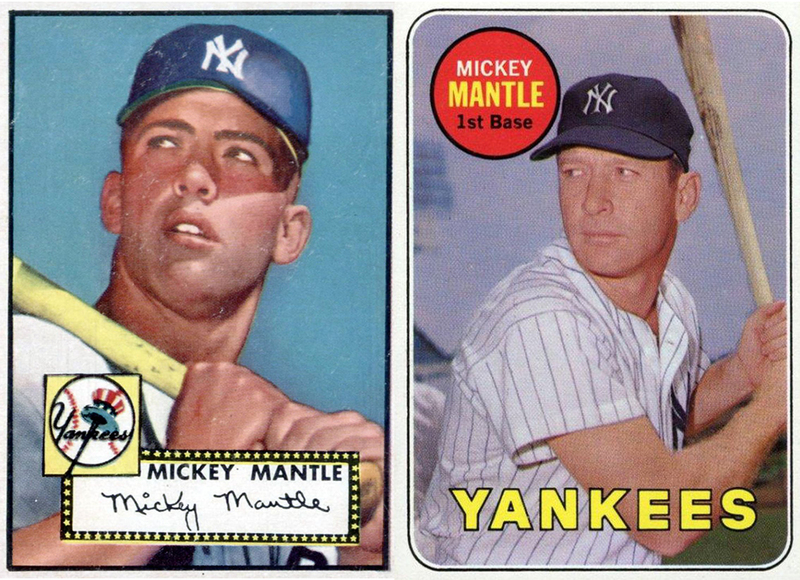 Left: Topps baseball card for 1952, Mantle’s first full season as a major league player for the New York Yankees, when he replaced Joe DiMaggio as the team’s centerfielder. This card is one of the most sought-after by collectors; a mint copy recently sold at auction for $2.8 million. Right: The Topps card for 1969, issued the year after Mantle’s final season, when he played first base. “The All-Star announced his retirement on March 1, 1969!” declares the top of the reverse side, above a chart of Mantle’s career stats. There are two sides to Mantle. Who is Mickey the Good? Mickey the Good was the guy who stopped the Yankee team bus en route to a Florida exhibition game and gave $100 to a homeless man lying by the railroad tracks. Who is Mickey the Bad? The autograph wasn’t the only thing Leavy got out of that meeting. She interviewed the baseball hall-of-famer and devoted one of her columns in The Washington Post to an account of his life after he took a job at an Atlantic City casino. As a girl growing up in the Bronx, she had idolized Mantle, but it turned out to be a heartbreaking story to write. She didn’t mention in her compassionate profile that on the evening of the day she first met him, he was so drunk that she had to fight off his clumsy advances and, with help from a waitress, drag him up the elevator and deposit him in his hotel room. His career after baseball, however, was far less storied, dominated by drunken revelry. “I’ll never get a pension. I won't live long enough,” he joked, until it was no longer all that funny. After several years as “director of sports promotions” at Claridge Hotel and Casino, Mantle became co-owner of a wildly successful, eponymous restaurant on Central Park South. (It closed in 2012, after a 24-year run.) Mantle often showed up—and drank—at the restaurant, greeting guests and signing autographs, but in 1994 he owned up to years of “blackouts and memory loss” and entered the Betty Ford Center in California. He emerged chastened and sober, but it was too late. The following year he was diagnosed with liver cancer and died two months after receiving a liver transplant. Jane Leavy began working for The Washington Post in 1979, the year after a federal court ordered the Yankees to allow female reporters into the clubhouse. The players suggested that the women were there to sneak furtive glances; “I used legal pads and Sharpies to take notes, as a strategic shield, so I could put the large pad in front of my eyes,” Leavy said recently. 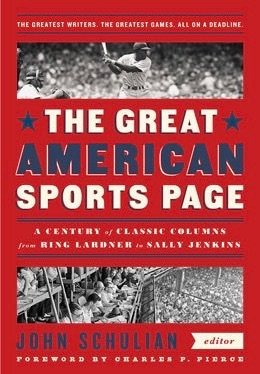 Her account of Mantle’s gig in Atlantic City, “The Man Baseball Forgot Plays the Hand He’s Dealt,” is included in the new Library of America anthology, The Great American Sport Page: A Century of Classic Columns from Ring Lardner to Sally Jenkins, which will ship from the printer next week and be available from booksellers in late April. We present it below as our Story of the Week selection; the brief headnote by the anthology editor John Schulian summarizes Leavy’s career. This past fall she added an acclaimed biography of Babe Ruth, The Big Fella, to her three previous book publications. Notes: Mantle’s younger twin brothers, Roy and Ray, both played minor league baseball for New York Yankees farm teams in the mid-1950s. His namesake, Mickey Cochrane, was a catcher for the Philadelphia Athletics in the 1920s and early ’30s and a player-manager for the Detroit Tigers from 1934 to 1938. At the end of the piece, Mantle refers to two songs. “Talkin' Baseball (Willie, Mickey & The Duke)” is a 1981 song written and performed by Terry Cashman; its signature line refers to the home run–hitting centerfielders who played in the 1950s for the three rival New York teams: Willie Mays for the Giants, Mantle for the Yankees, and Duke Snider for the Brooklyn Dodgers. “I Love Mickey” was a 1956 song cowritten and performed by Theresa Brewer, with Mantle himself on the recording, responding “Mickey Who?” to the song’s repeated refrain. The Triple Crown is the honor awarded to a player who leads the league in batting average, home runs, and runs batted in. In the sixty-plus years since Mantle won it in 1956, only three players have achieved the distinction: Frank Robinson (1966), Carl Yastrzemski (1967) and Miguel Cabrera (2012). Mickey Mantle has these recurring dreams. He’s gliding down the runway with a vaulter’s pole in his hands. And it’s strange because he’s never pole-vaulted in his life. . . . If you don't see the full selection below, click here (PDF) or click here (Google Docs) to read it—free!